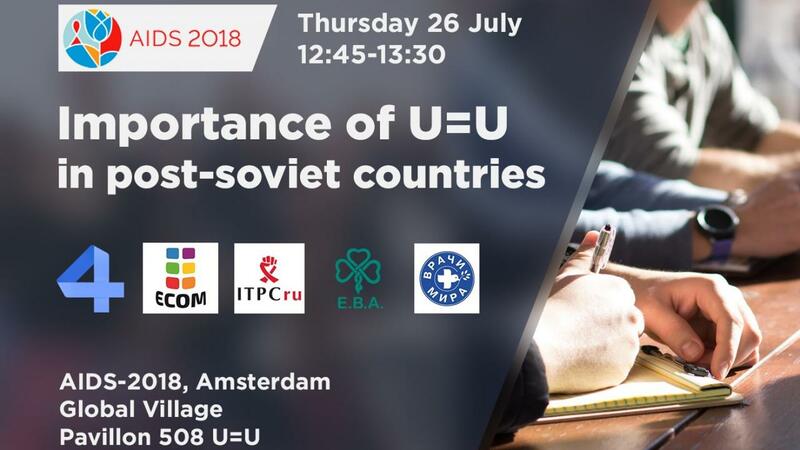 During the International AIDS conference AIDS 2018 in Amsterdam at the U=U networking zone in the Global Village, Life4me+ and its partners will hold an event about the importance of U=U in the EECA region. We will talk about how can help U=U to increase access to treatment, U=U and key population MSM, drug users, women; share experience about U=U within professional communities/doctors, important “pro” for U=U in the conversation with communities and/or doctors. Much more at the U=U networking zone in Pavilion 508, Global Village, July 26, starting at 12:45. This event will take place in English and Russian (translation provided). Please add to your schedule right now – July 26, 12:45 - 13:30 pm.